Note from shop owner We are off for Christmas! Thank you for all your orders of 2017! It was our best year yet! We are off for Christmas! 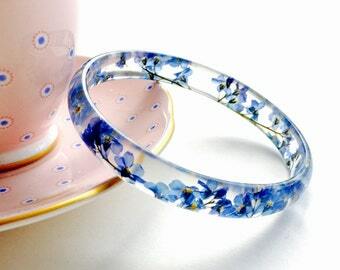 Beautiful bangle, and beautiful packaging. I can't wait to give it as a gift to my mother-in-law. New gift bags with my Forget Me Not Bangles! I started off making wedding jewellery because I was getting married that year and quickly learned skills through self teaching how to make jewellery. After I was married I started to make standard jewellery you wouldn't find, but then came across buttons then the whole quirky jewellery thing began. From buttons I have went on to use, keys, stamps, pencils, tape measure etc, to create funky designs! No day or week is the same now and thats what I love most! Owner, Maker, Designer, Making Jewellery, Taking Pictures And Shipping! I graduated from university with an Honours Degree in Building Surveying in 2006. I became a member of the RICS in 2009. In 2010 I gave that career up to be a happy wife and crafter, thus Ruby Bijou was born! Ruby Bijou Jewellery is Handcrafted by Linda Carmichael, in her little studio in the coastal town of Donaghadee, Northern Ireland. Linda loves to bring quirky to jewellery in a way that you will love your item for a long time and it's not just a novelty thing! Ruby Bijou wants to bring excellent customer service and satisfaction. If you are not completely satisfied with your purchase due to a DEFECT or shipping damage, you may return your product within 30 days of the shipping date on record. Unfortuantely I cannot accept returns on any personalised or bespoke item. Cancellation of sales can be requested but not guaranteed. Please pay for your item within 3 days and order which is not paid in this time will be cancelled. Got over excited and decided that you don't want the item you ordered? Thats ok drop send me a message and we can sort things out! My aim is to dispatch any order within 3-5 days. I will let you know when your item is posted and if you are outside the UK I will let you know approximately how long it will/should take to arrive! I am posting from Northern Ireland (UK) , keep in mind if you are located outside of the UK as items may take over a MONTH to arrive, so your patience is greatly appreciated. I send all packages outside of the UK by Airmail, but due to high postage costs in the UK I do not receive a TRACKING NUMBER with the item. I always retain proof of postage. Orders are NOT tracked unless posted within the UK, please contact me if you would like a tracking number with your order. Packages are NOT insured. If the buyer would like to purchase insurance, it is available at an additional cost. If your package goes missing a replacement may be sent if the customer pay the shipping.